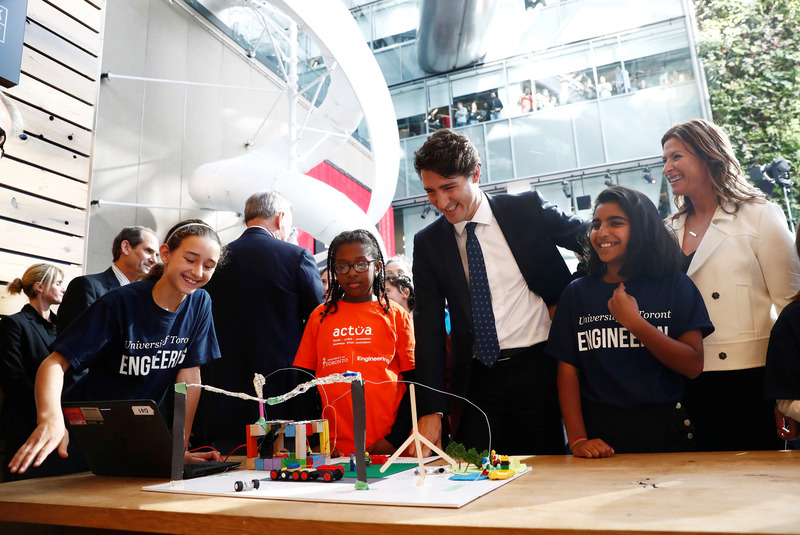 Prime Minister Justin Trudeau looks at city models built by children before attending a press conference where Alphabet, the owner of Google, announced the Sidewalk Toronto project, a high-tech redevelopment of part of the city’s waterfront, on October 17, 2017. Applying blockchain technology for social good. Considering the pros and cons of smart cities. Helping Canada become more digitally competitive. Redesigning education for a changing global economy. 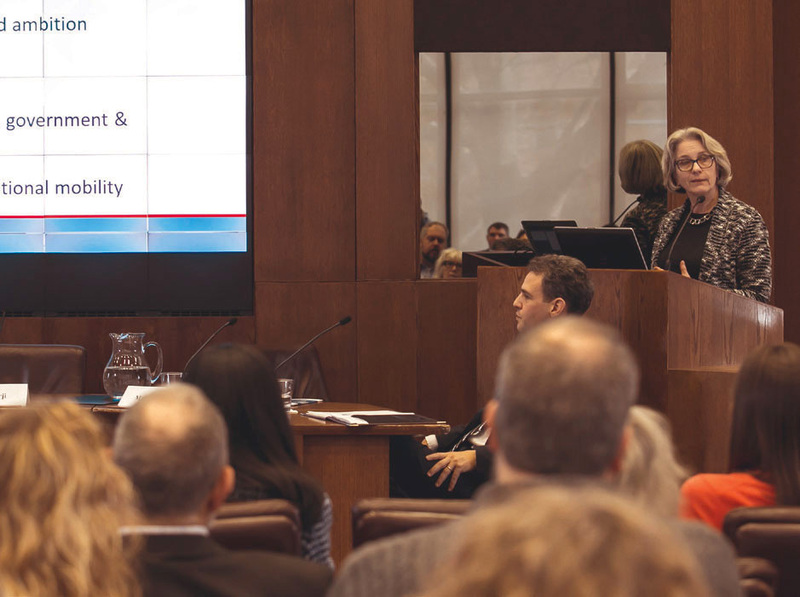 These are the kinds of multidisciplinary challenges that Munk School students and scholars are investigating as we help to mobilize academic research into the broader community and connect Canadian innovators to the global marketplace. Top: MGA students, guided by Prof. Shiri Breznitz, help address real-world challenges posed by MaRS Data Catalyst. 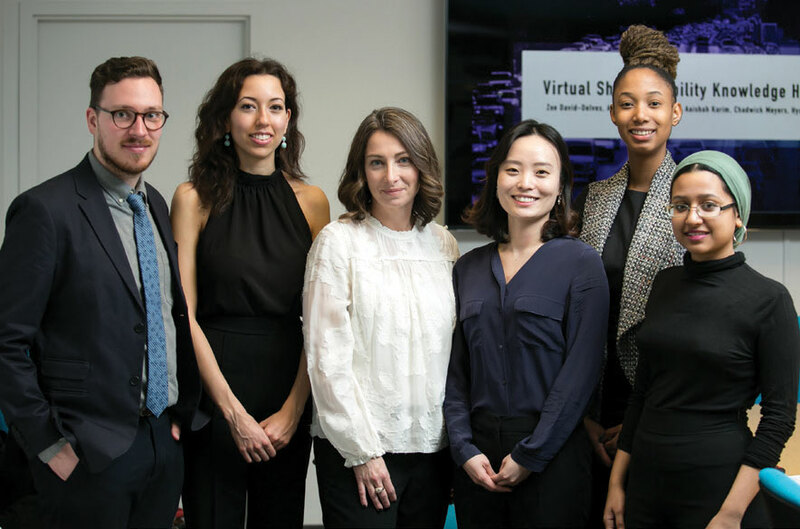 Left to right: Chadwick Meyers, Ashley-Nicole Harrison, Prof. Shiri Breznitz, Hyuna Yi, Zoe David-Delves and Aaishah Karim. MaRS Data Catalyst explores policy initiatives for the digital economy as part of Toronto’s MaRS Discovery District, a globally recognized centre of innovation. 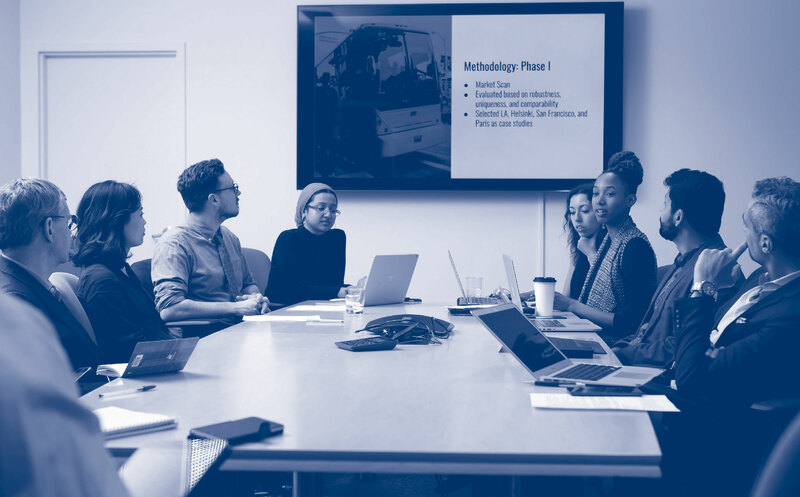 A first-time client of the MGA Capstone program, the data think tank wanted help in creating a knowledge hub where residents of the Greater Toronto and Hamilton Area could access integrated transit information. After studying other cities’ solutions, students proposed a data-sharing model that would help people plan the most efficient ways to get from A to B. MaRS Data Catalyst is reviewing how to translate their recommendations into policy – and then into a viable technology. MaRS Solutions Lab, another initiative of the MaRS Discovery District, sought help from MGA Capstone students in analyzing the innovation ecosystem that has developed over the past decade along the Toronto-Waterloo corridor. 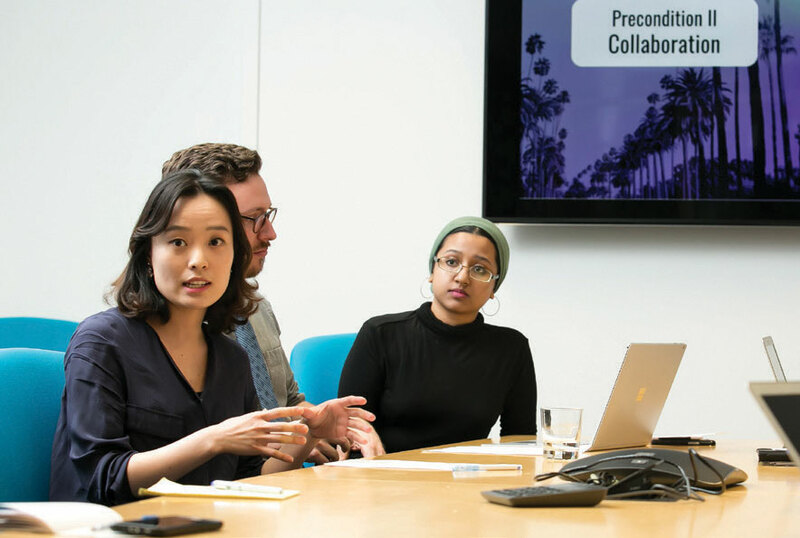 After researching comparable regions in the U.S., Sweden, China and other countries – including through interviews with key players – the students offered their insights on how to raise the global profile of what is arguably Canada’s premier innovation cluster. Ontario’s Ministry of Economic Development and Growth asked MGA students to help investigate the potential impact of fintech disruptors on Canada’s financial services sector, which is largely centred in Toronto. Notwithstanding the strength of Canada’s financial system, epitomized by the Big Five chartered banks, how easy would it be for newcomers – whether innovative startups or established tech giants – to penetrate the Canadian marketplace? Through extensive background research and interviews with industry representatives, students provided ministry officials with new insights into potential sources of disruption. Grand Challenges Canada, a not-for-profit that fosters health and economic development solutions in the developing world, invited MGA students to evaluate a number of projects that have been funded to scale over the past five years, assessing their impact and long-term sustainability. After interviewing representative stakeholders, the Capstone team shared its findings and proposed a matrix of factors that Grand Challenges Canada could use to better gauge which programs are succeeding and which require additional attention. Promise and Peril in the Smart City (left to right): John Lorinc, senior editor, Spacing; Tracey Cook, executive director, Municipal Licensing and Standards, City of Toronto; Peter Sloly, partner and national Security & Justice lead, Deloitte; Enid Slack, director, Institute on Municipal Finance and Governance; Zachary Spicer, visiting researcher, Institute on Municipal Finance and Governance; Pamela Robinson, associate professor, School of Urban and Regional Planning, Ryerson University; and David Wolfe, co-director, Innovation Policy Lab, Munk School of Global Affairs. 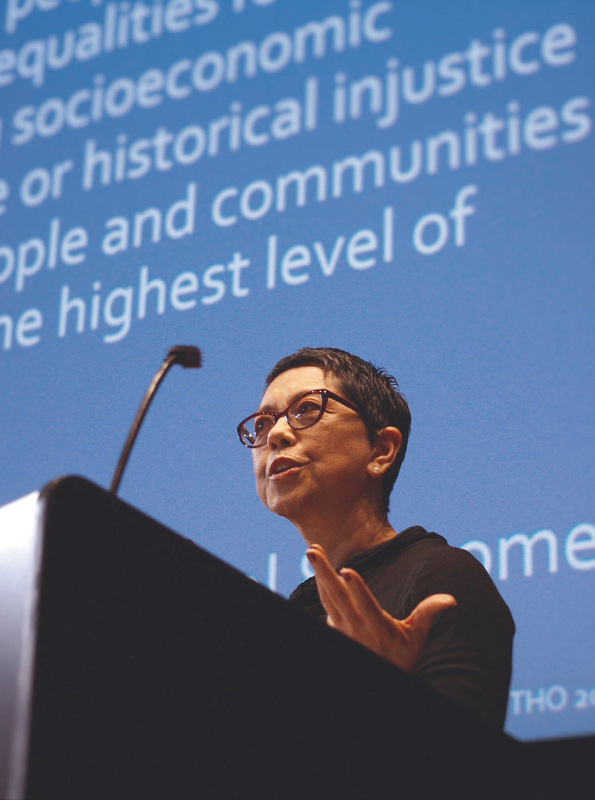 Understanding Smarter Cities: Prof. Patricia O’Campo, Social & Behavioural Health Sciences Division, Dalla Lana School of Public Health. Understanding Smarter Cities (left to right): David Wolfe, co-director, Innovation Policy Lab, Munk School of Global Affairs; Kumar Murty, professor, Department of Mathematics, University of Toronto; Enid Slack, director, Institute on Municipal Finance and Governance; Judy Farvolden, program director, Transportation Research Institute; Patricia O’Campo, Social & Behavioural Health Sciences Division, Dalla Lana School of Public Health; Robert Wright, director, Centre for Landscape Research, John H. Daniels Faculty of Architecture, Landscape, and Design, and dean, Faculty of Forestry; Janice Stein, founding director, Munk School of Global Affairs. Over the past year, many scholars and groups across the Munk School examined the potential impacts of “smart cities” powered by data-driven technologies that promise to make urban life more efficient, hospitable and sustainable. 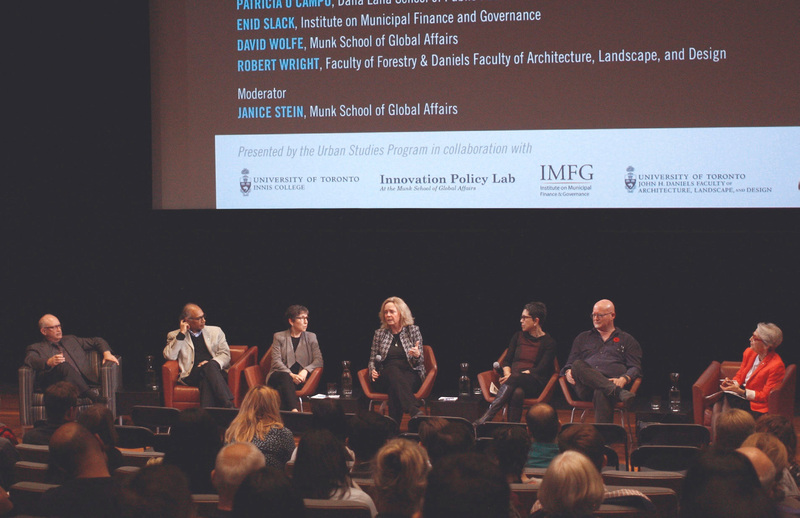 At a November 2017 event titled “Understanding Smart Cities: What Happens Next?” Prof. David Wolfe, co-director of the Innovation Policy Lab, and Dr. Enid Slack, director of the Institute on Municipal Finance and Governance (which is based at the Munk School) were among the U of T experts on a panel moderated by Prof. Janice Stein, founding director of the Munk School. A catalyst for the conversation was the news that Sidewalk Labs – which sits alongside Google under the Alphabet corporate umbrella – plans to develop an innovative, digitally enabled urban community on Toronto’s waterfront. 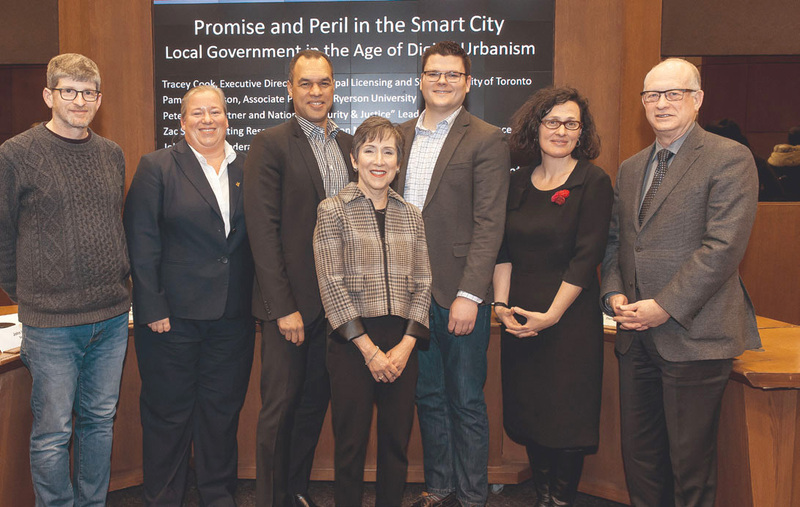 The topic was explored in even greater depth at a January 2018 event, “Promise and Peril in the Smart City: Local Government in the Age of Digital Urbanism.” Presented by the Institute on Municipal Finance and Governance and the Innovation Policy Lab, the panel discussion brought together representatives of municipal government, the private sector and the academic community – including Dr. Zachary Spicer, a visiting researcher at the institute and a research associate with the Innovation Policy Lab. Panellists discussed how using technology to deliver municipal services and governance holds tremendous promise for creating efficiencies, engaging community members and managing scarce resources. At the same time, though, the push for smart cities risks increasing inequity – the so-called “digital divide” – and allowing too much private control of personal data and urban space. All agreed on the need for new forms of regulatory oversight and a strong public voice in the decision-making around adopting smart solutions. 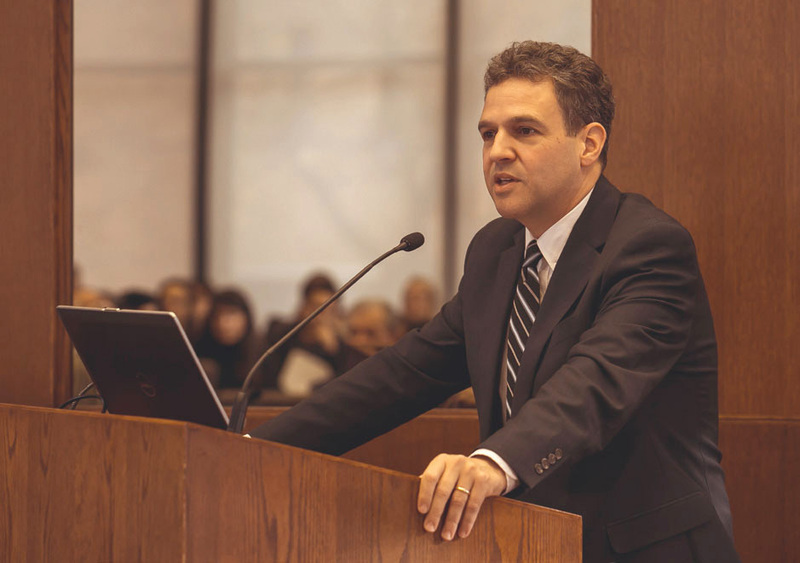 Prof. Randall Hansen announces the publication of a new education report. 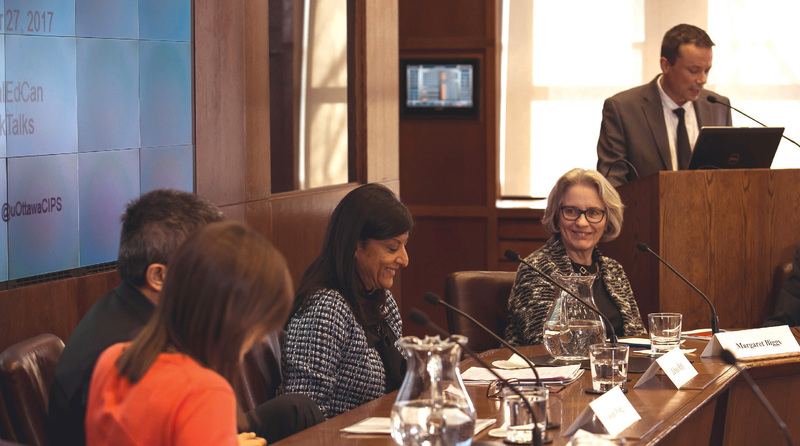 Left to right: Delila Biki´c, graduate Munk School of Global Affairs; Prof. Joseph Wong, Munk School; Zabeen Hirji, chief human resources officer at the Royal Bank of Canada, a member of the study group; and Margaret Biggs, group’s co-chair and Matthews Fellow in Global Public Policy, School of Policy Studies and Department of Political Studies, Queen’s University. With these comments, Prof. Randall Hansen, interim director of the Munk School, announced the November 2017 publication of a new report, Global Education for Canadians. It was produced by the Study Group on Global Education, an independent team of educational leaders, business executives and policy experts from across Canada, established under the auspices of the Munk School and the Centre for International Policy Studies at the University of Ottawa. Prof. Hansen and Prof. Margaret Biggs wrote the report’s preface. Foster the advanced skills that Canadian companies are seeking, including adaptability, resilience, teamwork, intercultural awareness and effective communications. Build the global connections that Canada requires in a world of increasing competition and diversified trade. Reinforce the values of openness and inclusion that are essential to Canada’s success as a diverse and prosperous society in a time of rising intolerance. Prof. Roland Paris, group co-chair and professor of international affairs at the University of Ottawa.